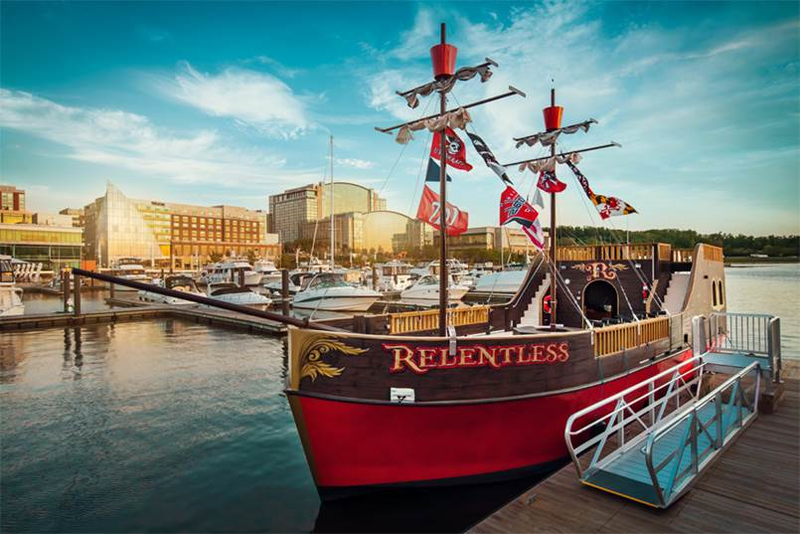 Join the Urban Pirates in National Harbor and climb aboard the pirate ship for an exciting Swashbuckling Adventure. Learn to dress, talk and play games like a true pirate. Fight enemies with water cannons, navigate treacherous waters and discover hidden treasures. Sailing out of National Harbor April through October. Climb aboard a Family cruise, or for you older swashbucklers, an Adult only ‘Bring Your Own Grog’ voyage, sure to bring out the pirate in anyone! Urban Pirates 54′ Pirate Ship docks at the base of the Capital Wheel at the end of the pier. Each cruise lasts roughly 1 1/2 hours. We require a minimum of 15 people for any cruise to sail. If we do not receive the reservations, we will work with you to switch you to a different sailing date.